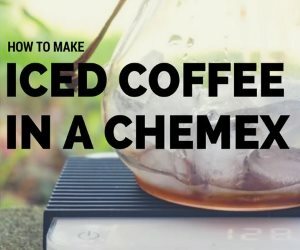 For almost 100 years, coffee was the hot beverage of choice in England, and, unlike the English family’s tea of the last 200 years, it was not consumed at the breakfast table or indeed at any other time or place in the home. 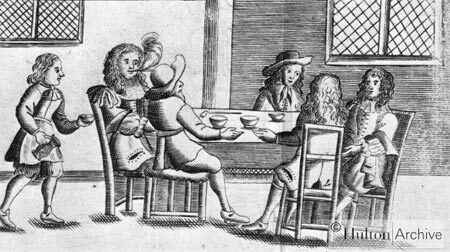 Instead, from about the mid-1600s through the mid-1700s, men (and just about all pictures from the period show only men in coffeehouses) drank their coffee in London’s coffeehouses while they transacted business, discussed politics, and shared literary works in progress. 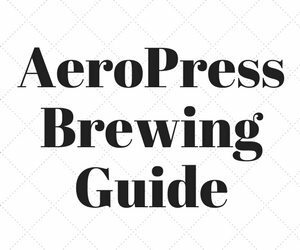 By 1700, there were probably over 2000 coffeehouses in London or one for every 300 inhabitants. Then Heaven in Pity . . . 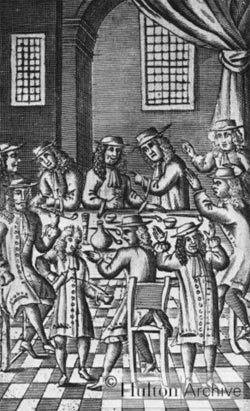 It was precisely such fears that led the government to suppress coffee houses by royal proclamation in 1675. However, the suppression seems not to have been enforced, because the number of coffeehouses continued to grow over the 1670s and 80s. The link between coffee and business became even stronger than the author could have imagined. The famous essayist Richard Steele (1672-1729), editor of The Tatler, listed its business address as the Grecian coffee house. 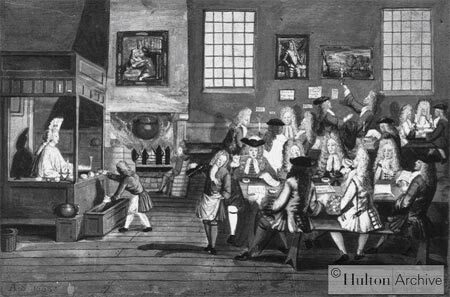 In the late 1600s, a coffee house owned by one Edward Lloyd became a meeting place for merchants, ship owners, ship captains, insurance brokers, and others involved in overseas trade. Because so many of his customers came to hear the latest business news, Mr. Lloyd began publishing the news in his own periodical. Soon he was making more from his newsletter than from his coffee. 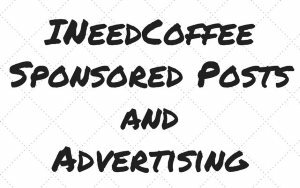 Insurance brokers in particular found his services so useful that they began meeting their clients at his coffee house, and soon they were renting booths in his shop. Even after Edward Lloyd’s death in 1713, insurance brokers continued to meet at the coffee house. By 1774, Lloyd’s had become a corporation owned by brokers and underwriters and had moved its quarters to the Royal Exchange. By then, of course, tea had begun to supplant coffee. For a crucial century, though, the growth of England’s commerce and the emergence of a large, politically aware middle class in London are intimately connected with coffee and coffee houses. The Character of a Coffee-House (1673), in Coffee-Houses Vindicated (1675), in Edward Potts Cheyney, Readings in English History (1908) and in Paul Halsall, Internet Modern History Sourcebook www.fordham.edu/halsall/mod/modsbook.html (site down December 2014). Paul is a Professor of History at Missouri Southern State University Joplin.